NOTE: This is a bugfixed and spit-and-polish update. The initial release notes below are still from the 1.6.6 release. RetroArch 1.6.7 has just been released! Grab it here. – SCANNER: Fix directory scanning. – SCANNER: Fix file scanning. – COMMON: Fix ‘Disk Image Append’ option. – FREEBSD: Compatibility fixes for Video4Linux2 camera driver. – GUI: (MaterialUI) Add disk image append icons. – GUI: (MaterialUI) Improve word wrapping when menu icons are enabled. – GUI: (MaterialUI) Add User Interface -> Appearance -> Menu Icons Enable. You can turn on/off the icons on the lefthand side of the menu entries. – GUI: Performance optimizations for XMB menu driver – only calculates visible items. Picodrive should hopefully work now again on Android after notaz‘ updates. Beetle PSX’s OpenGL renderer should now work on various AMD GPUs thanks to rz5‘s efforts. There were previously some black screen issues on certain non-Polaris AMD GPUs. Beetle PSX – Fixed bugs (geometry updates had max width and height unset, other ones) (by albertofustinoni). Beetle Saturn – Unloading game leaves core unusable fix (by albertofustinoni). Beetle Supergrafx – add turbo on/off for 2-button controller mode (by retrowertz). Prosystem – NTSC Color Palette updates and DB updates (by underball). RetroArch 1.6.6 has just been released! Grab it here. – 3DS: Fixes serious performance regression that affected every core; rewind was always implicitly enabled. – AUDIO: MOD/S3M/XM sound should now be properly mixed in with the core’s sound. – GUI: Visual makeover of MaterialUI. – GUI: Added ‘Music’, ‘Images’ and ‘Video’ collection options to RGUI/MaterialUI. – GUI: Allow the user to add ‘Favorites’. – GUI: Allow the user to rename entries. – GUI: Performance optimizations for XMB menu driver. – INPUT: Overlay controller response – when we press buttons on the gamepad or keyboard, the corresponding buttons on the overlay will be highlighted as well. – NETBSD: Silence some compilation warnings. – COMMON: Fixed bug ‘Deleting an entry from a playlist would not update the list view inside XMB’. If you want to read about the latest bounty and core updates, read this post instead here. 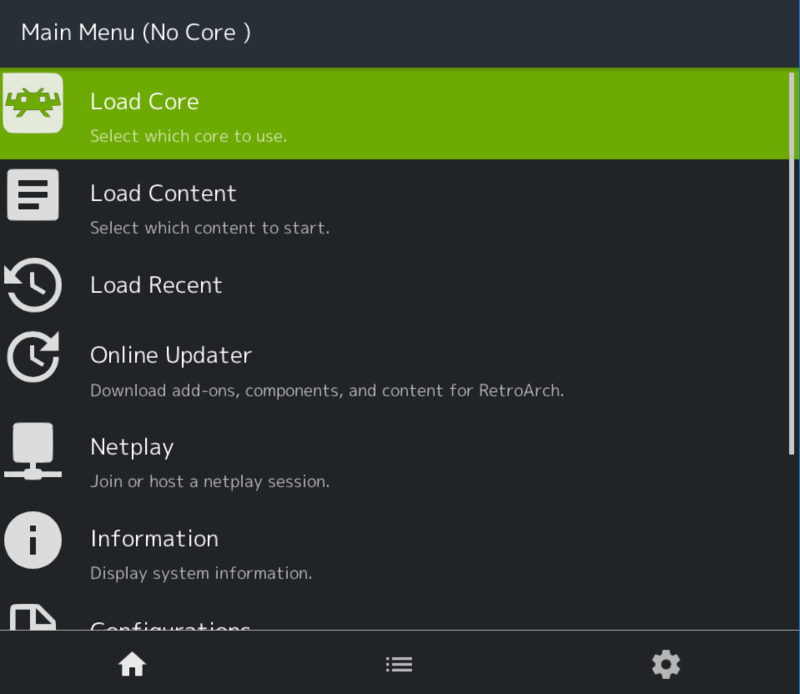 On mobile devices, RetroArch uses the mobile UI, MaterialUI, by default. This interface is designed around touchscreen and pointer devices like a mouse/trackball. We have given this menu interface a significant overhaul now for version 1.6.6! We are aware that there is a significant percentage of people that to date have been completely unsatisfied with the current state of the menu system on mobile devices like Android and iOS. Our menu UI improvements in version 1.6.6 is our first step to try to remedy this. In later releases, we might follow it up with more elaborate animations, more advanced widgets, etc. – The opacity of the game’s image clashed quite badly with the ingame menu before. This has been rectified. – We have added ‘Music’, ‘Image’ and ‘Video’ playlists to the ‘Favorites’ tab. 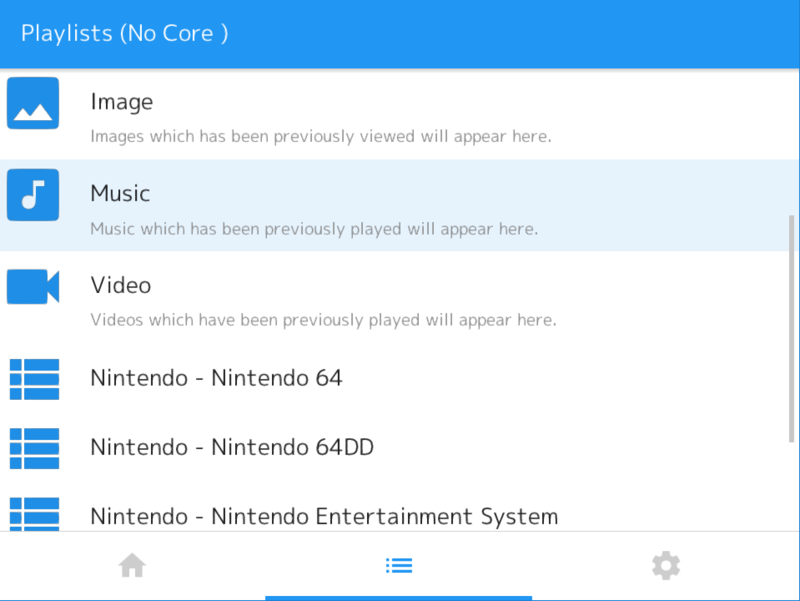 Music, Video and Images which have previously been loaded in RetroArch can be easily accessed from the Playlists tab now. – The file browser is easier to read now because files show up with specific icons to indicate what they are. For instance, music files have a music icon, a directory has a folder icon, selectable content files show up as a plain file, etc. 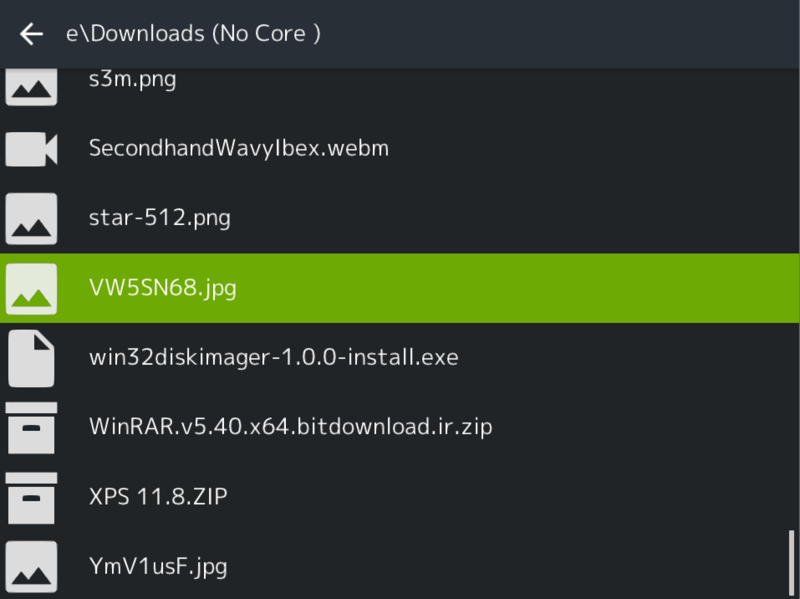 The file browser is easier to read now because files show up with specific icons to indicate what they are. For instance, music files have a music icon, a directory has a folder icon, selectable content files show up as a plain file, etc. You can customize the color theme of the menu in MaterialUI at any time. 1 – Go to User Interface. 2 – Go to Views. 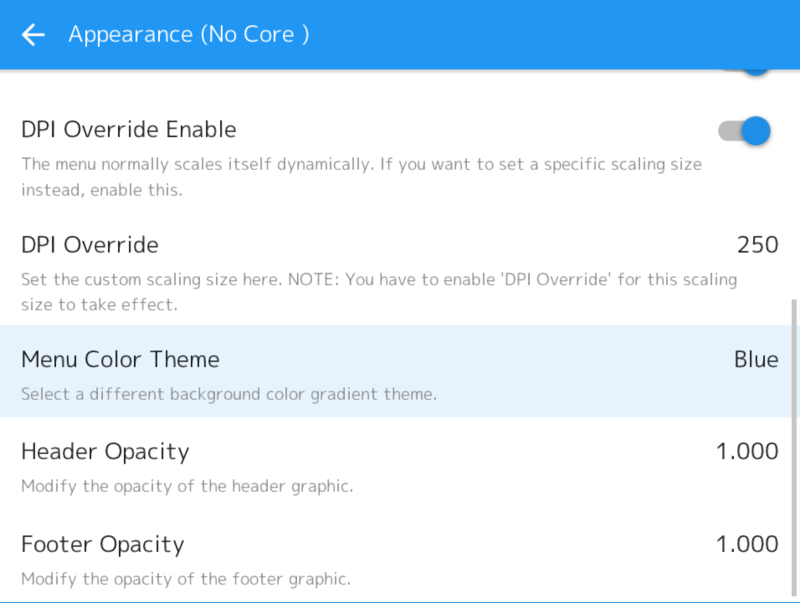 3 – Go to ‘Menu Color Theme’ and set it to the color theme you want. You can now add a game to a ‘Favorites’ list for easy access! This has been an often-requested feature for years, and in the past we always felt that ‘Load Recent’ was good enough. However, if you load a lot of content, that can easily get cluttered over time. 1 – Once a game is running, go to ‘Quick Menu’. 2 – Select ‘Add To Favorites’. 3 – Once added, you can now start the game at any time from the Favorites list. On RGUI – go to Load Content -> Favorites. On MaterialUI – go to the Playlists tab -> Favorites. On XMB – go to the Favorites tab. To add a game to the ‘favorites’ list, inside Quick Menu, select ‘Add To Favorites’. It should now be added to the Favorites list. You can access the ‘Favorites’ list inside MaterialUI by going to the Playlists tab. On RGUI, you go to Load Content -> Favorites. On XMB, you go to the Favorites tab instead. You can now rename an entry from any playlist! 1 – Go to a playlist of any type (it can be the history list, a system playlist, favorites, music/video/images playlists, etc). 2 – There should be an option called “Rename”. Select it. 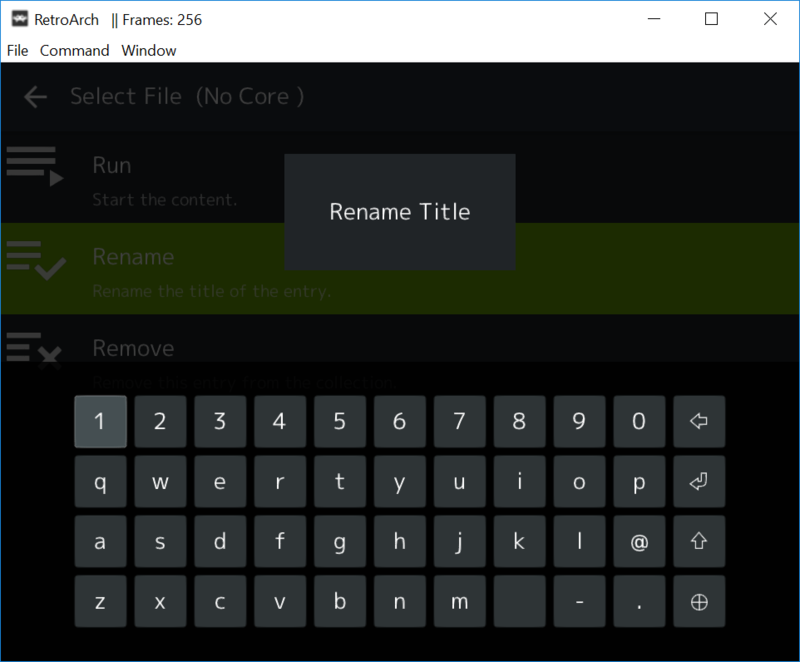 If you are using MaterialUI and/or XMB, an onscreen keyboard will now pop up. Input the new title for the entry and then hit either the Enter key on your keyboard ,the Start button on your gamepad or press the ‘Enter’ key on the onscreen overlay in order to confirm the changes. You can now rename any entry! Say for instance you loaded a Quake data file. Instead of the playlist showing ‘PAK0.PAK’, you can rename it to Quake 1 instead. Previously, overlays would only show button presses if they were actually being clicked on by either the touchscreen or the mouse. 1 – Go to Onscreen Display -> Onscreen Overlay. 2 – Go to ‘Show Inputs on Overlay’. Set this to off if you don’t want the overlay to react to keyboard/gamepad input, turn it on if you want this to happen (turned on by default). A serious issue has been fixed in the Nintendo 3DS RetroArch port which compelled us to push this release sooner rather than later. It appears that by mistake, rewind was always forcibly enabled in the 3DS port, which led to a halving of performance. This should now be fixed. We are still determined to get the promised cores like PPSSPP into your hands before the end of the month. We just felt it very important to get this release out of the door so that people can see that we are determined to improve the menu on mobile, and also so that the 3DS RetroArch port is repaired again. it seems there was a regression in libogc at some point which lead to this input regression. Superssonic reports that going back to an older version of Wiiuse fixes the issue. What we are probably going to do is make a custom baked-in libogc version for the Wii port for the next release. 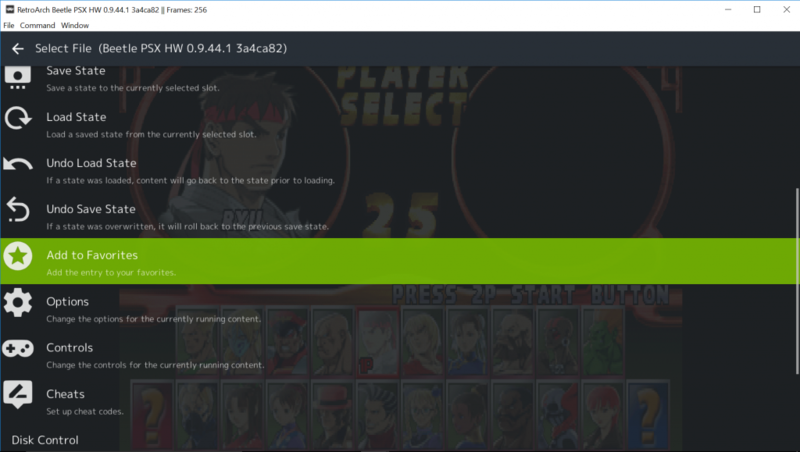 Previous post:RetroArch 1.6.6 – Released!